We have a very large and growing percentage of our people that do not know or understand anything about our Constitution, the form and function of the government that it creates, and the fundamental principles that it was built upon. More and more are buying in to the erroneous notion that the Constitution is simply an outdated document concocted by rich, white, racist, slave-owning men, and, because of those reasons and that we have progressed so much in our technology and basic ways of life, it should be considered obsolete to our current, modern circumstances. While true that many (not all) of the founders who created the Constitution were slave owners and probably burdened with many other flaws, if we disregard the brilliance of the Constitution because of that, it will result in our collective peril. Let’s face it, if we were to dismiss everything that flawed men created, we would need to dismiss everything ever created by men, as all men are flawed. I believe that if you indulge me and follow along in these essays with a rational and open mind, you will be inclined to agree with my conclusions. If not, I would welcome any reasoned and civil arguments for debate and discussion. We can debate which principle is more important than another, but that doesn’t really matter. They are all important, and working together, they create the basis upon which the Constitution was built and should be used to measure all issues that we debate. After discussing the main principles listed above, we’ll then move into covering the basic structure of government, and the reasoning behind each effort, that was created to account for these principles. So who am I to talk about the Constitution and the ideas and principles behind it? A politician holding high office? No, I’ve never held any office. A professor of political science? No. A lawyer who specializes in constitutional law? Not even close. How about a political pundit/talking head on TV? Nope, I’m not that either. So who am I? I am none of those so-called “experts”…yet, I am the most important cog in the entire system of government our founders created for us. I am the Informed Citizen. In order for our system of self-governance to work, it requires informed citizens, first and foremost above anything else. Without informed citizens, the entire thing falls apart. The vast majority of our people have no idea of the basic principles and structure of our Constitution and the system of government it creates. The 2017 Annenberg Constitution Day Civics survey shows that only 26% of people could name all three branches of government, which is among the very most basic understanding of our system. 33% could not name even one branch of government and 27% could name only one. That means that over half (60%) of the people could not name any or only one of the branches of government! There are many very good reasons for the way things are supposed to work within this system and without knowing these reasons, it’s difficult to have constructive debates about issues. Instead, we get two sides, neither of which fully understand these principles, yelling at each other and accomplishing nothing. This is not sustainable for a self-governing people. It is imperative that the people are informed, not just about current events, but how we can best deal with them based on sound principles and foundations. 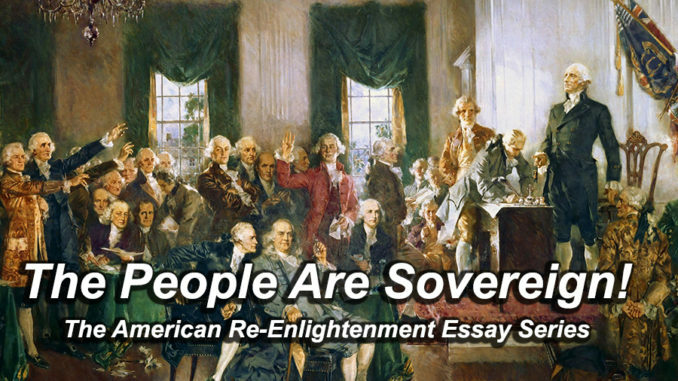 The People Are Sovereign! is a series of 30 essays that will be posted on a daily basis. The series will continue tomorrow with Essay 2 – American Exceptionalism.